AST DGC - Dextrorotary Glucose Crystals! On sale now! Ingredients: Pure Dextrorotatory Glucose Crystals. DirectionsRecommended Use: Mix 1 serving (4 level tablespoons) of DGC in 16 ounces of water, juice, or add to your whey isolate and shakes. Consume before and/or during and after workouts. 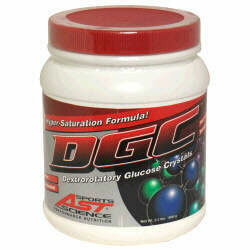 For endurance events and aerobic activities, mix 1 serving (4 level tablespoons) of DGC into 32 ounces of cold water and drink before, during and after event or exercise.